Damage to the one vehicle left at the scene on Detroit Street. 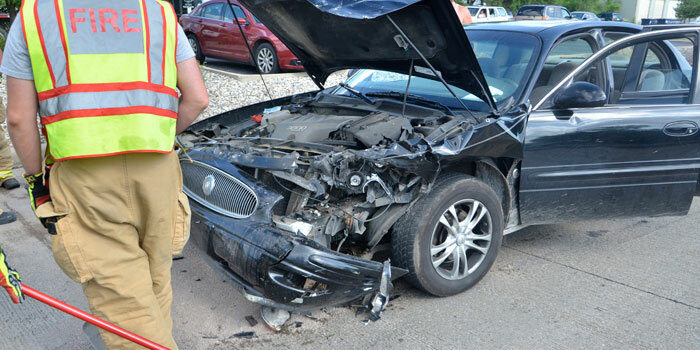 WARSAW — At least two people were injured earlier this week when three vehicles collided on North Detroit Street, Warsaw, including a 6-year-old child. At approximately 5 p.m. Monday, July 11, a black 2000 Buick, driven by Gary D. Jones, 27, West Syracuse Street, Milford, was northbound in the lefthand lane on North Detroit Street. Jones told police he did not see that a gray 2014 Chevrolet Equinox, driven by Katelyn E. Sills, 18, East Jefferson Street, Warsaw, had come to a stop in front of him. 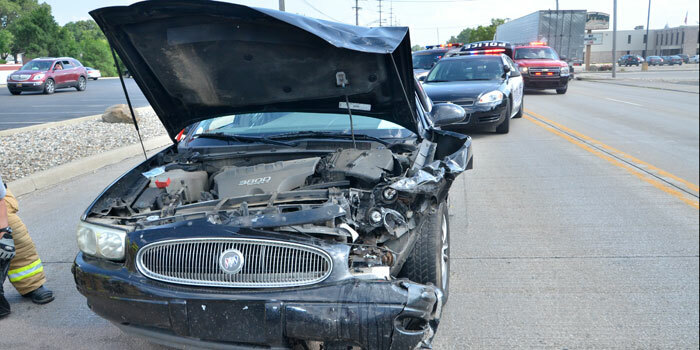 The Warsaw Police Department responded to the call. According to a crash report, Jones’s vehicle rear-ended Sills’ vehicle, pushing it forward into a brown 2012 Chevrolet, driven by Ronda J. Traver, 51, East Beer Road, Milford, which had also come to a stop. A passenger in Jones’s vehicle, Tania L. Semons, 26, West Syracuse Street, Milford, was transported to Kosciusko Community Hospital with a broken foot and a second passenger, age 6, was also transported with a nose bleed. Officers cited Jones for driving without proof of financial responsibility. Damage from the crash is estimated up to $25,000.